There’s a good argument that this is one of the most successful graphic designs in the last 1,000 years. Perhaps that’s why it seems to be laughing. Aside from religious iconography, there aren’t too many symbols that have remained in common usage for 500+ years. From the middle ages skulls and crosses were inked next to deceased crew members names on ship manifests. Of course, by the 1700’s — as the ‘Jolly Roger‘ — we saw the symbol used on pirate flags. The flag was intended to intimidate victims into surrendering their ship with as little fight as possible. From around 1850, the skull came to be used to label ‘poison’. At that time, the convention was also to use blue, ridged glass on poison bottles — but that fell out of favor in the 1900s. Keep it simple: Your symbol may need be reproduced at small scale and in poorly lit environments. Avoid written language: Even if your user is literate, it may not be in your selected language. Avoid reliance on culture: A good symbol shouldn’t rely heavily on previous knowledge, fairytales, folklore, history, science or other special learning. As a poison identifier, the skull and crossbones has done a good job at each of these. It’s certainly simple, and text-free. If it has a weak spot, it’s arguably that last point. When does a child first understand exactly what a skull is? Sure, they might know it’s a face of sorts, but would they comprehend that they are looking at bones — and what that implies? At 3 years old? Maybe 5? It must vary. What’s more important is how culture has accidently softened the symbol’s meaning. 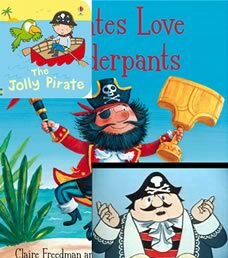 Take a look around any toy store — even the toys and books for toddlers abound with fun and friendly pirates, almost always emblazoned with jolly rogers. It wouldn’t be crazy for a child to conclude that any bottle labelled with the jolly roger indicated that the contents were recommended for drinking while dancing a jig or sword fighting. 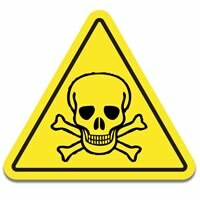 So, is there a better symbol for marking poisons? Perhaps there has been. In the 1970’s Dr. Richard Moriaty came up with this — ‘Mr. Yuk‘ — as a new poison labeller. As a Pittsburgh Pirates fan, Moriaty found that far from a deterrent, pirate imagery was in fact well-loved by his patients, both young and old. Moriaty’s alternative symbol used a ‘yucky’ green face, squinting eyes and a stuck-out tongue to communicate the idea of a nasty flavor. Any kid who ever spat out a brussel sprout knows what this means — perhaps before they can even talk. Humans are social animals and we’re born with advanced face-interpreting software. Moriaty’s child-like icon taps into that innate ability. So, why don’t we see Mr. Yuk everywhere now? Although the Mr. Yuk icon gained some mindshare at the time, the design is currently still owned, trademarked and copyrighted by Moriaty’s employer — The Children’s Hospital of Pittsburgh of UPMC. Unlike the skull and crossbones (public domain), you can’t use Mr. Yuk on your poison bottle without the explicit permission of the hospital. We’re stuck with the pirate flag for now. At least be thankful that — for all their plundering, blood-thirsty violence, bad language and poor hygiene — pirates were never fierce defenders of their trademarks. As a child in Pittsburgh in the 70s, I grew up with Mr Yuk and can still recite the jingle they used in their television commercials! I always wondered whatever happened to that campaign... and I'm not surprised to learn that UPMC wouldn't let people use it without compensation! Maybe I'm a hippy, but to me, it seems like UPMC ended up with a useful design almost by accident. It's a design motivated by the fundamental idea of a doctor wanting to stop small children from poisoning themselves. Which is obviously a noble idea. So, if you get the rare chance to reach outside of your city and do something that matters globally -- seems like an opportunity.